Posted on March 4, 2016 by Helena K.
Roofing color is one of the most important features homeowners consider when selecting a new roof, often trumping even brand and style. Roof replacement is one of the most expensive routine home maintenance endeavors most homeowners will undertake. As such, cost and durability are two of the major factors informing roofing product purchasing decisions. However, as interest in home design, aesthetics, and environmental responsibility has grown, the choice of roofing materials has become more important than ever before; rather than simply replicating their current roofs, consumers want to enhance the appearance, value, and function of their homes by thoughtfully considering both roofing type and roofing color. Today, homeowners often have a unique vision for what they want their home to look like and color is a central factor in realizing this vision; in fact, color is so important than 90% of contractors say roofing color can determine both the brand and type of product their customers select.2 In response to this market demand, roofing manufacturers are now offering an extraordinary array of color options to meet the needs of today’s discerning consumers. Along with expanded color choices comes a heightened need for advanced color quality monitoring within the roofing product industry. New paint technologies are allowing even darker colored roofs to maximize light reflectance. To enhance the possibilities of both form and function, the roofing industry has developed a range of new roofing products to give consumers more choices than ever before. In addition to traditional materials such as slate, asphalt and wood shingles, and formed clay tiles, homeowners are now offered everything from asphalt-fiberglass to painted metal, to plastic polymer roofing options to address the limitations of traditional materials. Whether homeowners are looking to restore a heritage home to its former glory, give a Mediterranean home its distinctive Spanish tile roof, or incorporate solar-reflective paints to fight the urban heat island effect, roofing color can be essential to creating the aesthetic and functional effects homeowners are seeking.3 As such, instrumental color quality monitoring that can accommodate for variation in shape, gloss, and texture is essential to producing a satisfactory result and ensuring that the roof matches the customer’s vision. Today’s modern spectrophotometers offer the highest level of color quality control using optical geometries and technologies that can produce accurate measurement of all sample types, from smooth painted metal sheets to heavily textured shingles. Because the ultimate goal of spectrophotometric color monitoring of roofing products is to ensure a pleasing appearance to the viewer, measurements must include not only color, but the geometric properties that inform a product’s final look. Designed to mimic the way the eye sees color, 45°/0° reflectance spectrophotometers are the ideal tools for capturing the both the effects of color and the range of attributes that influence appearance. By integrating spectrophotometric monitoring within laboratory settings and on an ongoing basis within the production stream, roofing manufacturers can be assured that their products are correctly formulated and consistently manufactured. Pairing your spectrophotometer with sophisticated software packages such as Easymatch QC allows you to establish a customized color system tailored to your tolerance levels. The result is an extraordinary level of color control that both enhances your reputation for quality and can generate significant cost savings. Accurate color matching is paramount to ensuring new and old roofing components create a pleasing, cohesive appearance. 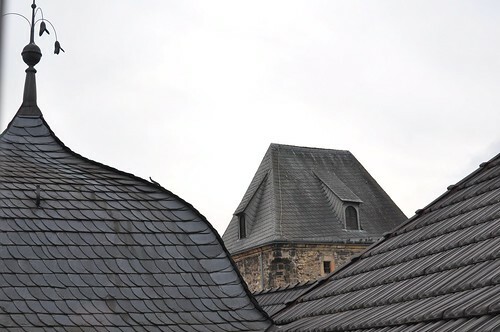 Although roofing materials have come a long way in terms of functional and aesthetic durability, constant exposure to the elements still take their toll. As such, roofing color tends to change over time, whether drastically or in barely perceptible ways. When a roof needs a repair or partial restoration or a homeowner is adding on to an existing structure, matching the color of the new materials to the existing roof is paramount to creating a cohesive appearance; even the slightest color shifts that go unnoticed by homeowners can become glaringly obvious when a newly produced product is integrated, compromising the visual harmony and, potentially, the value of the home. HunterLab’s lightweight, portable spectrophotometers give roofers the ability to analyze color information on-site at customers’ homes to facilitate the color matching process. Unlike most portable instruments, HunterLab’s MiniScan EZ series offers dual-beam configurations to optimize accuracy and ease of use, augmenting both reliability and operator-friendliness. Using the sample data captured in the field, roofers may then select a perfect match from existing inventory or create a custom solution that will seamlessly blend with existing materials. HunterLab offers the most advanced color measurement tools available to give builders unprecedented color quality control and matching capabilities. As pioneers in the field of spectrophotometry for over 60 years, our comprehensive range of instruments has been designed to meet the evolving needs of our customers and give them the highest level of accuracy, versatility, and flexibility to stay at the top of a competitive marketplace. Contact us to learn more about our innovative spectrophotometers, advanced software packages, and dedicated customer service supports. This entry was posted in Color in Building Materials. Bookmark the permalink.